Share your photos on Instagram with the hashtags #hollywoodtrousers and #lieslandco. 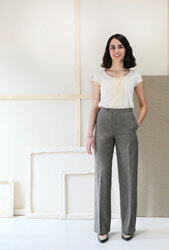 Trousers: Suitable for lightweight wools like wool suiting, tropical wool, and wool crepe. 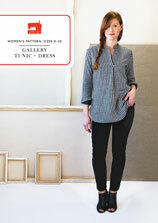 Also suitable for twills, fine-wale corduroy, and drapey canvas. Lining (optional): Cotton lawn, rayon lining (known as cupro or Bemberg), or China silk. * Optional and only required if you are not lining the trousers. Pocket lining is included in the yardage for the lined version. Hip 36 1/2" 37 1/2" 38 1/2" 39 1/2" 40 1/2" 41 1/2"
Rise 9 1/2" 9 3/4" 10" 10 1/4" 10 1/2" 10 3/4"
Outseam 42" 42 1/4" 42 1/2" 42 3/4" 43" 43 1/4"
Waist 33" 34 1/2" 36 1/2" 38 1/2" 40 1/2"
Hip 43" 44 1/2" 46 1/2" 48 1/2" 50 1/2"
Rise 11" 11 1/4" 11 1/2" 11 3/4" 12"
Outseam 43 1/2" 43 3/4" 44" 44 1/4" 44 1/2"
I don't often wear trousers because I have never found a pair that fitted nicely and flattered my (slightly odd) shape. Enter the Hollywood trouser pattern, I made a muslin to check the fit and after a few seam adjustments, lengthening the leg to allow for heels etc I can honestly say I will sew these again and again. I've planned a pair in a lovely grey linen for summer at work as well as a lovely wool blend pair for winter, totally a winner. 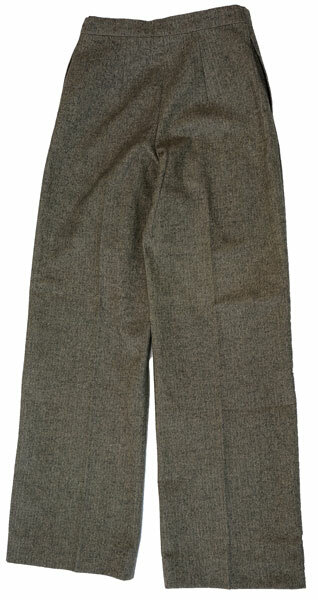 This was first pair of pants with a fly and fitted waistband. My measurements match the size 0 but I needed a little more room in the upper hip so I made the darts and back seam smaller than the pattern required. I used a black tropical wool I bought on Etsy, of questionable quality, and the pants stretched when worn so I could have used the correct dart size and seam allowance. But, these were a wearable muslin so good for the first time. They are very verstile style and I will be making more pairs. Next time I may lengthen the rise but am not sure how to do that or if it is needed. One thing I think would really help the novice or intermediate sewist is more info on why the pattern may be adjusted and how to make the adjustments. I made a "muslin" out of denim with a slight amount of stretch in the fabric. I went down a size due to the stretch. The only adjustment I made was to make the back darts slightly bigger to accommodate my waist/sway back. This is a beautifully drafted pattern and I can't wait to make it again. The only issue I had was with making the buttonhole due to excess bulk in the waistband. I don't believe I trimmed it down enough. I gave up and used a hook instead (which works fine). 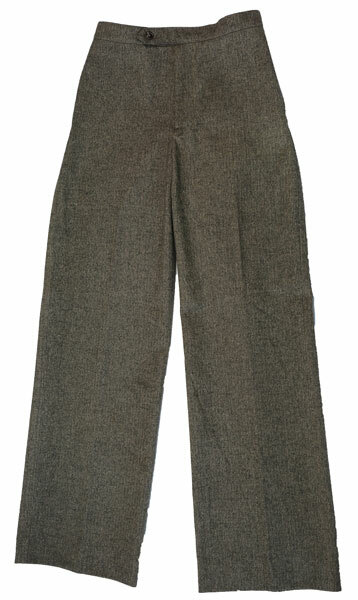 Discussion on the digital hollywood trousers sewing pattern from the Oliver + S Discussion Forums. Find and share more photos on Instagram using the hashtags #hollywoodtrousers and #lieslandco.